I have just been to the pub; the Atlas near Earl’s Court, a stone’s throw away from Stamford Bridge, home of Chelsea FC. But the best bit is, I consider this part of my job. 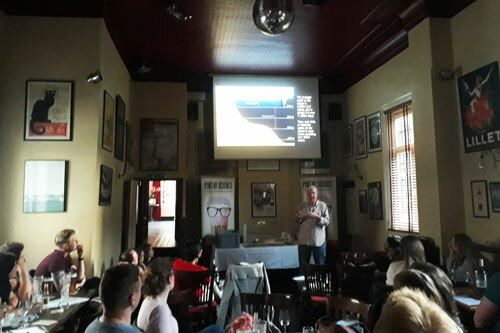 I was there to deliver a talk on my research to around 40 people enjoying an evening out as part of a Pint of Science event. Pint of Science is an annual science festival that takes place every May and brings researchers to local pubs to present their scientific discoveries. This year in the UK there were over 500 events in 32 towns, from Exeter to Edinburgh, which, over 3 days, were attended by over 22,500 people. Similar events took place in 21 other countries around the world, bringing the total number of people taking part to around 100,000 worldwide. My particular event, called Blue Planet III, was sold out with 2 days of being advertised, and similar events in London were equally popular. My lecture centred around my 40 year career as a deep-sea marine biologist. The deep ocean (anything below 200m) accounts for over 99% of habitable space on the planet, yet we know comparatively little about it because it is so inaccessible. My lecture described how we investigate this hostile environment, introduced some of the creatures that live there and discussed their often strange feeding and sexual behaviour. Although sunlight is absent at most depths in the ocean, the majority of animals produce their own light. The functions and detection of such bioluminescence was also examined in detail. The other lecture at my event was given by Rob Deaville, who coordinates the investigation of all stranded cetaceans (whales, dolphins and porpoises) in the UK. Not only was his talk fascinating, it also became clear we had an overlap in our research interests. Therefore, within 24 hours of the event we had drafted a plan for a research collaboration and I am visiting the Zoological Society of London next week to pick up the first sample from a stranded porpoise. Therefore, apart from (hopefully) entertaining/educating the public, the event had the unexpected bonus of starting a research collaboration. Like most academics, I attend national and international scientific conferences. However, while I roamed far and wide for such events early in my career, these days it takes something very special to tempt me far from home. Yet, while my enthusiasm for academic conferences has waned, I find myself speaking more frequently in less formal surroundings as I undertake various PUS (Public Understanding of Science) activities. The reasons for this are twofold: As ultimately our research is funded, one way or another, by the general public, I believe we owe them the opportunity to find out how their money is being spent. More importantly, however, it is up to us to interest the young in the value, and above all the joy, of knowledge and to perhaps ignite the career of future academics. Reaching a younger audience is relatively easy as they are a captive audience in schools, and most teachers are only too happy to expand their curriculum with external speakers. I have given lectures on subjects as diverse as deep-sea marine biology, vision in pets and human eye disease in schools ranging from Milfordhaven in the West, to Sherborne in the South and Canterbury in the East. I have, however, never ventured further North than Stevenage! To reach adults I have spoken at a variety of events including a Science festival in Wrexham and Café Scientifiques in Croydon and Leeds. I have also talked at the headquarters of the Wellcome trust as part of their ‘packed lunch’ series and I am well established on the local Essex WI circuit! While these venues might be seen as standard, there have been occasions when they could not be described as such. I have, for example, talked in Selfridges department store in Oxford street at an event organised by a group called Guerrilla Science and been the support act for a jazz band in Oxford’s Holywell Music Room, the oldest purpose-built music venue in Europe. My recent venture in a London pub perhaps falls into this bracket. The size of the audience has ranged from close to 1,000 when talking to a number of schools at the Friends meeting house on the Euston Road, to two at the opening of a new science centre in Harlow. To date I have undertaken 84 such lectures, every one in its own way unique, but all equally rewarding (even if there were only two people there! ).